Arco del Tiempo is where the river La Venta dissappears underneath the rocks. The gorge is so narrow that the cliffs tops touch each other and close the gap. If you zoom in on Google Earth it's just forest with a vague notion of where the river flows. 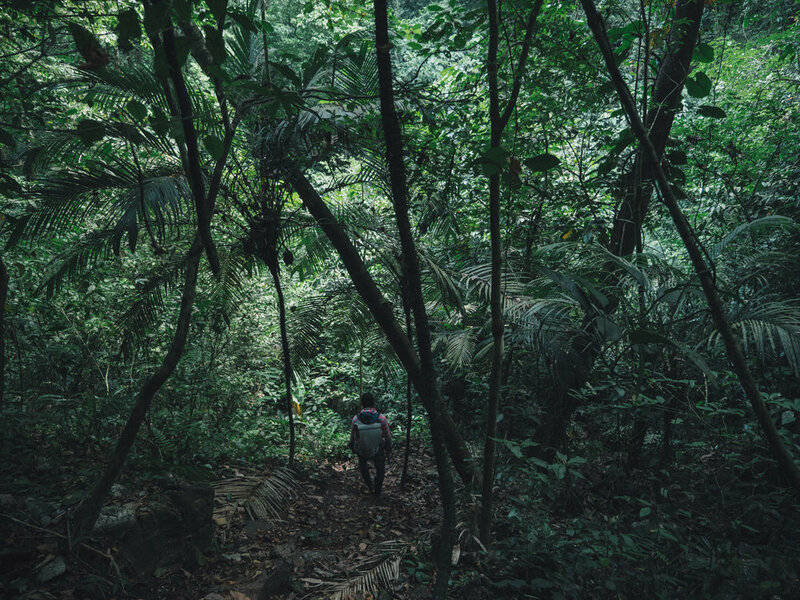 It’s hidden deep in the Chiapas rainforest, a 6km walk through thick jungle. I call my friend Martha in Mexico City to see if she knows people here. Via Whatsapp I get a bit of help of someone who has done this before. A taxi brings me to a place where Collectivo’s (shared taxis) leave. It's just a back street, without any sign or information about taxis. The few people waiting in the street tell me it leaves at 4pm, one and a half hour later. Not much later a small Toyota van arrives and after asking the ride is confirmed. In the last village is guide available to bring me to Arco del Tiempo. Sounds like this is going to happen. I take a little break in a local family restaurant. The children stare at me, apparently it doesn’t happen very often a tall white man sits at their table. Their stare is curious and fascinated. I try to connect with a two year old sitting in front of me on the floor but his big eyes keep looking at me without a move. When I get back on the street the van is still there. It appears we're not leaving at 4, but at 5pm. I don’t understand. I get back to guy on Whatsapp and he tells me about different timezones in the remote areas. Something called 'hora de dios'. Another hour waiting in the sun. I'm wearing sunglasses so I feel free to stare at an old lady which seems to have a horrible disease. The tip of her nose is rotting away and there’s a similar stain on her forehead. She looks sad. I wonder if she’s in pain. She probably is, and there is no money to see a doctor, as poor as these people are. The younger lady next to her, which could be her grand daughter, has the same sadness on her face. They speak softly to each other. 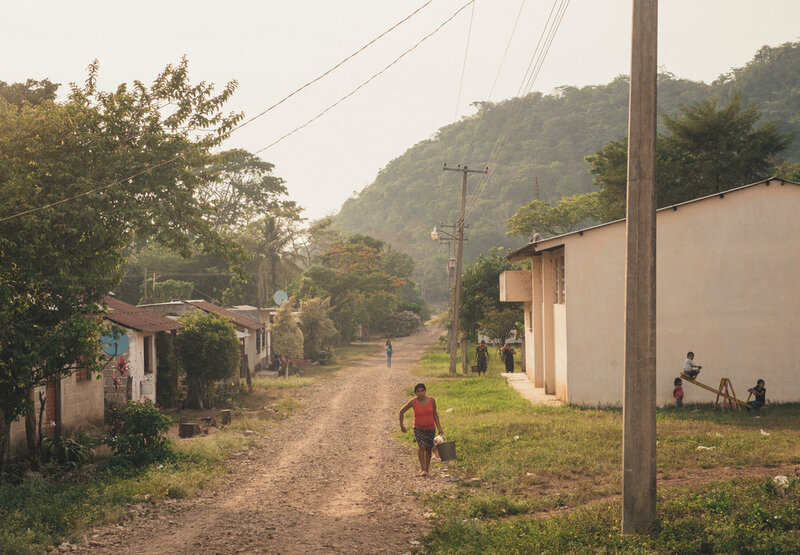 Chiapas is one of the poorest states, which is clearly visible here. Soon we're on our way through the grassy hills. The yellow sun low in the sky. I'm sitting in the far back, with about 10 other people filling the van. There is no airconditioning, the warm wind coming through the open windows carries a scent of overripe mangos. A sweet, heavy smell. It’s harvest season and they’re falling from the trees by numbers. What was the price of a mango again in Wholefoods, 4 US dollar? There’s a fortune lying on the ground along roads, which get eaten by birds and ground animals. I look at my phone while the signal gets thin. The roads is hardly visible on Google Maps. I have to zoom in far to make it visible. Soon the signal is gone. All of these villages haven’t entered the cellphone area yet, let alone the smartphone. Of course the younger generation use them, but there’s no use for it here in the villages where they live. The van stops a few times to let someone out. One is a man. He’s carrying to big trays of eggs and other groceries. His children run out from the scrappy house towards him. He pays the driver 10 pesos 40 eurocent). The driver knows where the villagers have to go out. With one arm out of the window he shouts casual things to the locals, keeping a cheerful mood. He knows everyone, sticking up his thumb to chilren riding squeeky bikes. They spy at the gringo in the back of the van, who secretly makes photos of them. In one hour we’re in General Cárdenas, the 6 km to the canyon needs to be done by foot tomorrow. The van stops at the corner of the little village and I pay the driver 35 pesos. I look at my phone and see on Google Maps that the cabins are a little further, just outside the village. A young guy welcomes me and invites me into the house. There is some confusion and we’re lost in the language barrier. Because I don't speak Spanish, he doesn't speak much to me at all. Later when I enter the house I see all the climbing gear and understand that he is the guide. I want to make a phone call to tell my Airbnb host that I am safe (he had asked, because of the recent troubles in Chiapas), but there is no reception. There is only one house in the village which has a satellite phone. Moments later I'm in the cabin. I take a cold shower while being watched by a huge black spider from the corner of the ceiling. I set up my laptop to write a bit, but it's so extremely quiet here that I can't concentrate. I'm a vacuum, disconnected from the noises of the world, without phone connection of wifi. It feels like the edge of civilisation, literally. An old lady comes by to bring me food, there's no nearby. It's very basic, baked eggs, corn tortilla served in a towel, sliced tomatoes and warm Corona beer. She would come back in the morning at 6am to bring breakfast and quesadillas (grilled tortilla with cheese) to take with me on the hike. It was still dark when my alarm went off. I realised I made a mistake with the time difference. It was 6am on my phone, but 5am for the locals. Everything was black in front of my eyes and I found out that there was no electricity, so also the lights outside were out. Some villages only have electricity in the daytime and evening hours, enough to keep the fridge cool for the entire day. An hour later the guide and his grandmother showed up, it slowly got lighter. We started walking at sunrise through the green jungle. It wasn't very hot yet, but still I sweat a lot. Me wearing shorts, tanktop, and walking shoes. The guide in denim trousers, a sweater and rubber boots. Despite carrying the climbing gear he was faster than me, and it looked like he didn't break a sweat. He didn't spoke much either. He did this already for 4 years and was only 20 years old. Now and then we took a short break to catch breath. The way to the river was up and down, but mainly down as you can see in the gps track below. In 2 hours we reached the river. The arch was rising up in front of us. The side of the hill was slippery and moist, swallows were flying in and out of the arch. It took a few minutes for the guide to prepare the ropes, I was the first to go down. It was a bit tricky if I could keep my back pack dry because the river we would be landing in was more than a meter deep at this time of the rain season. I rappelled down for about 25m until my feet got wet. The river got to my waste when I felt the bottom, just enough to keep camera gear dry. We spend about an hour wandering around in the river bedding. It's a truly magical place, wading through the warm river, standing under the arch to wait for the sun to shine through the other end, while the swallows fly in and out by numbers. The place is rich of bird life. We filled our water bottles from the water dripping of the cliffs and started the climb up again. In total we climbed about 800m and walked 15 km. My legs needed 4 days to fully recover from muscle pain. I thought they were used to some exercise but it seems the muscles you use for walking I different from cycling.